Xifaxanta is an antibiotic tablet used to treat travellers' diarrhoea. The active ingredient is an antibiotic called rifaximin. Xifaxanta tablets require a prescription and are taken over the course of three days. Travellers' diarrhoea comes as a result of bacterial infection. The way Xifaxanta works is by interfering with the bacteria’s cell structure and preventing it from reproducing. Xifaxanta is manufactured by Norgine and is only available via a prescription in the UK. Xifaxanta uses an active ingredient called rifaximin, which is a kind of antibiotic. The treatment is localised to work directly in the gut and is largely not taken up into the bloodstream. Rifaximin inhibits the production of an enzyme in the bacteria known as RNA-polymerase which stops its growth process and lets your immune system kill it off. Travellers' diarrhoea occurs after consuming contaminated food or drinking contaminated water, usually in a foreign country. It is most often caused by a bacterial infection, though in some cases, it is caused by a virus or parasite. 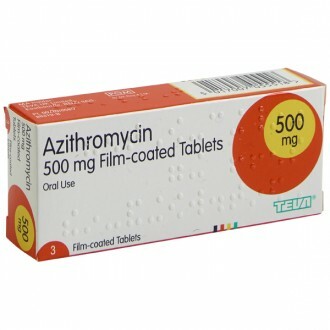 Apart from diarrhoea, symptoms include; nausea, stomach pain, loss of appetite and headache. These symptoms may not appear until after you have returned home. Traveller’s diarrhoea affects between 30% and 50% of all people who visit tropical destinations. If you get travellers' diarrhoea, make sure you rest and keep yourself hydrated. If your symptoms are severe or persist for more than a few days, you may consider a treatment such as Xifaxanta. 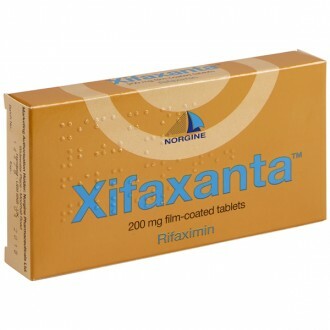 Xifaxanta contains the antibiotic rifaximin. This targets bacteria within the gastrointestinal system and stops the bacteria from dividing. This allows the immune system to deal with the existing bacteria. There are a number of precautions you can take while travelling to minimise your risk of contracting travellers' diarrhoea. Avoid drinking tap water, and only eat food that has been properly cooked. Take care of your own hygiene as well. The standard recommended dose of Xifaxanta is one tablet, three times daily: one every eight hours. Try to spread these doses out evenly. Never take two tablets at once. Even if you begin to feel well, you should continue the treatment until you have had the nine prescribed tablets. Swallow the tablet whole with a sip of water. Xifaxanta can be taken either with or without food. If your symptoms do not improve after 48 hours, you should see a doctor. Sodium starch glyconate type A, glycerol distearate, colloidal anhydrous silica, talc, microcrystalline cellulose, hypromellose, titanium dioxide, disodium edetate, propylene glycol, red iron oxide E172. Xifaxanta should be prescribed for no more than three days. If your symptoms persist or return, see a doctor. Seek medical help if your symptoms worsen either during or shortly after this treatment. This can be a sign of colitis or an inflamed bowel. 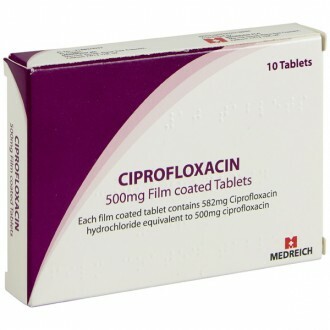 Clinical evidence has shown that Xifaxanta is not effective at treating Traveller’s diarrhoea when it is caused by invasive enteric pathogens such as Campylobacter jejuni, Salmonella spp., or Shigella, which typically produces a kind of dysentery-like diarrhoea characterised by blood in the stools and a high frequency. If you have taken activated charcoal tablets for your diarrhoea symptoms, wait at least two hours before taking Xifaxanta. Although Xifaxanta has a negligible absorption rate (less than 1%), it can cause the urine to have a reddish discolouration. Exercise caution when using Xifaxanta with any P-glycoprotein inhibitors such as ciclosporin. Xifaxanta should not be taken by women who are pregnant or breastfeeding. Need to know more about Travellers' Diarrhoea? Can I use this treatment for other types of infection? No – the effect of rifaximin is limited to the gastrointestinal system. It will not treat other kinds of infection, because it is not fully absorbed into the body like some other antibiotics. Is Xifanta suitable for everyone? Children should not use Xifanta. This medicine is also unsuitable for patients with a fever alongside diarrhoea. It should not be used if you have passed more than seven unformed bowel movements in the previous 24 hours, or if there is blood in your stool. Seek medical attention immediately if you experience these symptoms. You will be advised to take one tablet every eight hours. Swallow each tablet whole with a sip of water. This can be done either with or without food. Spread your doses out evenly as best you can. The course of treatment is three days long. See this treatment through, even if it seems that your symptoms have improved. Remember that Xifanta cannot be taken as a preventative medicine. What other measures can I take to feel better? While you are taking Xifanta, remember to replenish your fluids and stay hydrated with purified water. When you feel as though you can eat, stick to neutral foods such as rice or bread rather than fatty or spicy foods. Seek medical assistance if your symptoms have not cleared after three days of taking Xifanta, or if your symptoms recur soon afterwards. See a doctor if you develop a fever or if you notice your symptoms getting worse over the course of the treatment. Can I drink alcohol while using Xifaxanta tablets? It is not recommended to drink alcohol while experiencing symptoms of traveller’s diarrhoea as it can worsen your condition. Can I drive while using Xifaxanta tablets? As long as you experience no side effects which may increase your difficulty driving, you can do so. If you do notice any adverse effects then do not drive and contact your doctor. Can I use Xifaxanta tablets if I am pregnant? It is not recommended to use Xifaxanta tablets whilst you are pregnant or breastfeeding. You should see your doctor as soon as possible if you have travellers' diarrhoea whilst pregnant or breastfeeding - it is very important to avoid dehydration. How should Xifaxanta tablets be stored? Keep Xifaxanta tablets out of the reach of children and below 30°C. Are Xifaxanta tablets available over-the-counter? Xifaxanta tablets are a prescription only medication and can only be prescribed by a doctor. When you buy from The Independent Pharmacy, a private prescription from our doctors is included in the price of your treatment so you know that you are getting genuine treatment from a UK pharmacy.